Opera goers who saw “Das Rheingold” in 2016 and “Die Walküre” in 2017, Lyric’s first two operas segments of Wagner’s four-part “Der Ring des Nibelungen,” will find the next segment, “Siegfried,” still has tall scenery towers bookending the stage. They deliberately remind audiences that Wagner’s The Ring cycle is theater. It is theatrical and musical drama. But where the productions of the first two segments were highly creative but serious, “Siegfried” is playful, fanciful, serious fun. The tone is set when a somewhat menacingly large, three-nail-claw and an eye of Fafner, the giant-turned dragon who guards the ring, appear under the curtain and draw audience laughter. 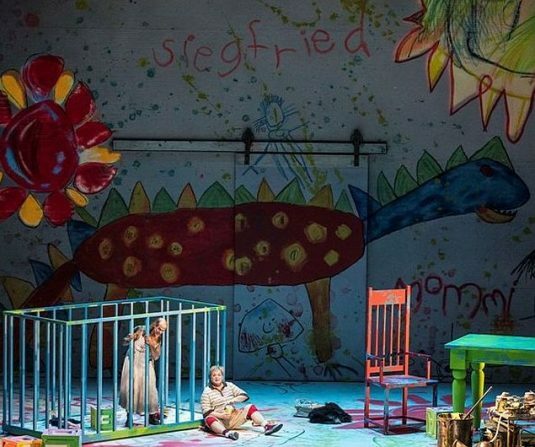 The curtain then rises to reveal Siegfried’s playroom of oversized art work and children’s furniture including a tall playpen. 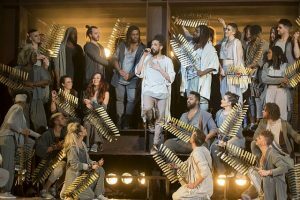 Experiencing ‘Jesus Christ Superstar,’ Andrew Lloyd Webber and Tim Rice’s rock opera at the Lyric, is akin to attending a high-powered rock concert. Amps are set on high much of the time so audiences really do need to already know the lyrics. The high intensity stage lighting designed by Lee Curran echoes those of Super Bowl half times. The main tenors, Jesus Christ (Heath Saunders) and Judas Iscariot (Ryan Shaw) mix singing with high-pitched, grating screams, and they, plus Pontius Pilate (Michael Cunio who is also a tenor) play their guitars on stage. In addition, the singers use mikes. Indeed, the mike handling is often a part of the choreography. In other words, the Lyric production would gladden the hearts of today’s Millennial Generation. The only problem with the Lyric Opera’s “Celebrating 100 Years of Bernstein” last Saturday, March 10, was that it was a one-time program. 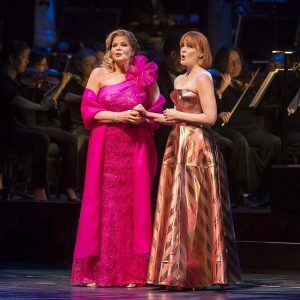 Mezzo-soprano Susan Graham, baritone Nathan Gunn in the first half featuring Bernstein’s short opera Trouble in Tahiti and joined in the second half in a variety of his works, by Broadway star Kate Baldwin, deserved their prolonged applause and standing ovation. Indeed, the audience didn’t seem to want to leave but encores were not part of the program. The audience also appreciated the really fine voices of Ryan Opera Center members soprano Diana Newman, tenor Josh Lovell and baritone Emmett O’Hanlon who added a light touch to the opera which has some seriously funny moments. And they, plus Ryan Center members soprano Ann Toomey and bass-baritone Alan Higgs, joined the stars in the second half. 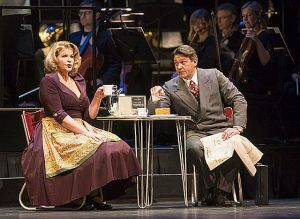 Pianist William Bllingham and Kate Baldwin in I Hate Music (but I love to sing). It would have been interesting to have seen a show of hands from people familiar with the cycle. Then, the Ryan Center singers did Candide’s “The Best of All Possible Worlds.” They and the leads closed with the lovely and appropriate “Some Other Time” from On the Town. What came in between was glorious. Conductor David Chase (Lyric Opera Orchestra in background) interacted with the audience as he explained “Trouble in Tahiti,” other musical numbers and occasionally asked who knew or had seen a particular piece. Baldwin sang Eileen’s charming “A Little Bit in Love” from Wonderful Town followed by Gunn doing a fine “Lonely Town” from On the Town. Based on intermission chat and looks through the program, many in the audience were hoping for something from West Side Story. There were two selections. Baldwin and Graham each soloed and then beautifully blended their voices in “I Have a Love.” Then Baldwin did a remarkable “Somewhere” that moved people to tears. At this point, about half way through the second half, comic contrast was needed and provided by Gunn coming up through the floor as Captain Hook from Peter Pan. Bernstein wrote “Captain Hook’s Soliloquy” for the original 1950 Broadway show but it was supposedly eliminated as unworkable with the voice of Boris Karloff who played Hook. 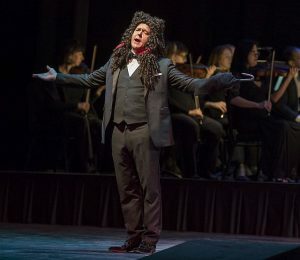 Wearing a wig that resembled a large black mop, Gunn hilariously interpreted the song somewhat in the manner of King George in Lin-Manuel Miranda’s Hamilton. Other songs seldom heard were “So Pretty” written by Bernstein for Barbra Streisand to sing in a peace protest against the Vietnam War that was sung by Baldwin and ”To What You Said,” a Walt Whitman verse put to music in Songfest that touched on homosexual attraction and sung by Nathan Gunn. A show which didn’t make it long on Broadway was 1600 Pennsylvania Avenue written with Alan Jay Lerner in 1976. But after cuts and revisions it was released in 1990 as A White House Cantata. Kate Baldwin as Abigail Adams sang “Take Care of this House” which is on the Cantata release. A lovely piece, the song is still heard on occasion. Before the company’s “Some Other time” closing number, Baldwin ended with another lively ditty, “I Can Cook, Too” from On the Town. There were many reasons the program left people wanting more. There was the spot-on direction of Peggy Hickey who had the singers actively move around the stage as if in a musical instead of a concert. The staging was also clever with props and furniture moved on, off and coming up from below. Another plus was Conductor David Chase’s warm interaction with the audience. He introduced and explained the opera and the musical numbers’ background. Experienced with working on musicals as conductor, arranger or supervisor of more than 30 Broadway productions, Chase had a relaxed attitude that made the entire program fun. Related: Lyric concert joins worldwide Bernstein celebration. 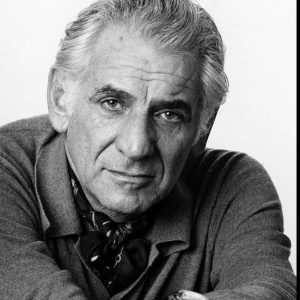 Leonard Bernstein’s genius for capturing the soul of America in everything from orchestral works, opera and religious tributes to musicals, ballets, choral pieces and songs for events, is being celebrated at venues throughout the world in honor of his 100th birthday. 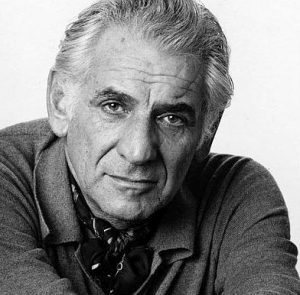 Lyric celebrates Leonard Bernstein’s 100 birthday with a special concert. Photo by Jack Mitchell. Musical tributes began on what would have been his 99th birthday, Aug. 25, 2017 (he died in 1990) but formally kicked off with a program at Washington D.C.’s Kennedy Center, Sept. 22, 2017. The celebrations are continuing through his 100th year. 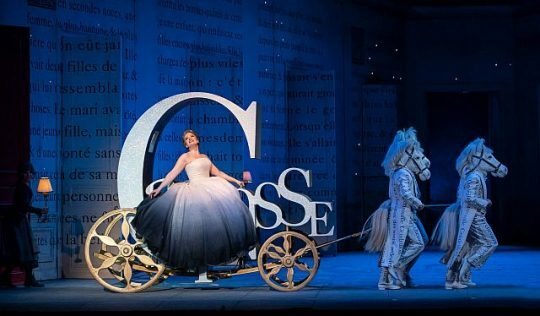 What the Lyric Opera of Chicago is doing promises to be exceptional. 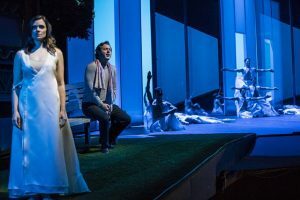 Opera stars mezzo-soprano Susan Graham and baritone Nathan Gunn take on the roles of unhappy suburban couple, Dinah and Sam in Bernstein’s one-act opera ,”Trouble in Tahiti.” The opera’s jazz interlude is done by Ryan Opera center ensemble members Diana Newman, Josh Lovell and Emmett O’Hanlon. They and Broadway star Kate Baldwin plus other artists will sing numbers from shows Bernstein did such as “West Side Story,” “Candide,” “Peter Pan,” “Wonderful Town” and “White House Cantata” (Originally titled “1600 Pennsylvania Avenue” written with Alan Jay Lerner) and other songs. There might be a song from “Songfest,” commissioned to celebrate America’s 1976 Bicentennial. Based on poems, it could be “To What You Said” (Walt Whitman). It is about love for another time and conflicted sexuality. Another program possibility is “So Pretty,” a 1968 anti-war song, Bernstein wrote with lyrics by Betty Comden and Adolph Green. Composed for a Broadway for Peace fundraiser at Lincoln Center, it was sung by Barbra Streisand. “I think it will be revelatory,” said Lyric dramaturg Roger Pines during a recent interview. “We have Nathan Gunn so we can do “Captain Hook’s Soliloquy,” It’s a tour de force. He as the right voice for it,” said Pines. “It was not sung in the original Broadway show (April, 24 1950) because Boris Karloff was Captain Hook (and also George Darling). The first half of Lyric’s program will be the opera which is sung in English. Pines notes that even though it was written and staged in the early 1950s, “Tahiti’s” marital communication problems are more universal then applicable to one time period. “Couples now can relate to the problems in their own relationship,” Pines said. He also thought people would appreciate Graham’s aria in her analyst’s office and the one she sings after leaving a horrible movie. “It’s comic,” he said. DETAILS: Celebrating 100 years of Bernstein, March 10, 7:30 p.m. at the Lyric Opera, 20 N. Wacker Drive, Chicago. For tickets and other information call (312) 827-5600 and visit Lyric Opera. Instead of organizing the desk (or you name it), and wishing the groundhog prognosticators were wrong about six more weeks of winter, take in a show, find a special event to dispel gray skies and moods and take advantage of museum free days. If the family has a Saturday available, get tickets to ‘Short Shakespeare! 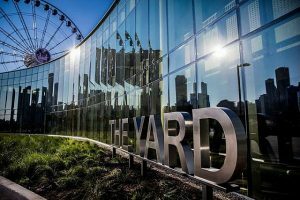 A Midsummer Night’s Dream’ at The Yard, Chicago Shakespeare’s newly added theater on Navy Pier . The show is a fun 75 minutes that merges the Bard’s humorous mismatching of characters in his comedies. The production is offered Saturdays now through March 10, 2018 at 11 a.m. and 2 p.m.. To get tickets visit Chicago Shakes Plays. Listen as famed tenor Lawrence Brownlee performs ‘Cycles of My Being,’ a recital that puts forth what it is like to live as a black man in America. Co-commissioned by Carnegie Hall, Lyric Opera/Lyric Unlimited and Opera Philadelphia, the program will only be in chicago Feb. 22, 2018 at 7 p.m. at the DuSable Museum of African American History. For more information visit Lyric Opera Cycles or call (312) 827-5600. Walk around gorgeous, delicate orchids at the Chicago Botanic Garden. Go to the Chicago Botanic Garden Feb. 10 through March 25, 2018 to see orchids with an Asian accent. 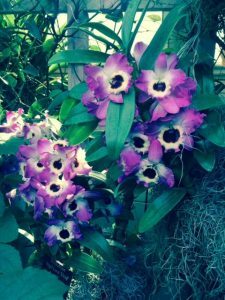 This year, the Garden’s Orchid Show blooms among kimonos, parasols and Asian plants. Hours are 10 a.m. to 4 p.m. plus open later Thursdays to 8 p.m. For more information visit Chicago Botanic Garden orchid. How about a night at the museum, that is among the fish? Explore the Shedd during an overnight stay. For Presidents Day weekend stay the night Feb. 16, 2018 in a special program at the Shedd Aquarium that allows participants to explore the museum, see an aquatic presentation and do a scavenger hunt. The cost is $75 per person ($60 members). 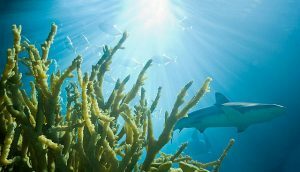 For tickets and more information visit Shedd Aquarium Overnight. Presidents’ Day, a federal holiday when most schools in Illinois are closed to celebrate Presidents Washington and Lincoln’s birthdays, is Feb. 19, 2018. Fortunately, some of Chicago’s museums are free that day. Some Chicago museums have free admission. The Adler Planetarium’s general admission is waved for Illinois residents Feb. 19-22. For more information visit Adler. 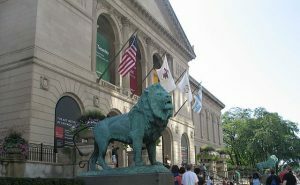 Art Institute of Chicago has free admission to Chicago residents under age 18, every day. See ARTIC. Chicago History Museum is free every day to children under 18 who are Illinois residents. Visit Chicago History. The Field Museum has free general admission for Illinois residents all of February. Visit Field Museum free days. The National Museum of Mexican Art always has free admission. See National Museum of Mexican Art. The Chicago Cultural Center has a new exhibition on its fourth floor. Titled “Nina Chanel Abney: Royal Flush,” it was organized by the Nasher Museum of Art at Duke University. The Cultural Center also has other exhibits on its first floor. 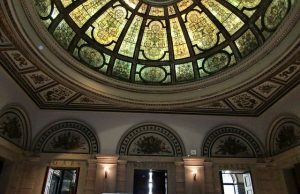 While in the building go to the third floor to see gorgeous glass domes and rooms. Admission is always free. Visit Chicago Cultural Center. With baritone Quinn Kelsey as jester Rigoletto, tenor Matthew Polenzani as Duke of Mantua and soprano Rosa Feola as Rigoletto’s daughter, Gilda, the only thing that could match the memorable experience is to have a recording to play their performances over and over. However, opening night, Oct. 7, was on radio (for anyone to record) and there still are seven more performances through Nov. 3, 2017. The opening night audience didn’t wait for the famed “La donna è mobile” sung by the Duke or the beautiful “Caro nome” by Gilda to yell an emphatic “Bravo.” Enthusiastic applause followed all arias of these virtuoso performers and at the quartet near the end. Written by Giuseppe Verdi in the mid 1800’s, “Rigoletto’s’ music and drama has been appealing to opera lovers since its premiere in Venice in 1851. Melodrama might be a better description but then, many operatic themes fit that category. 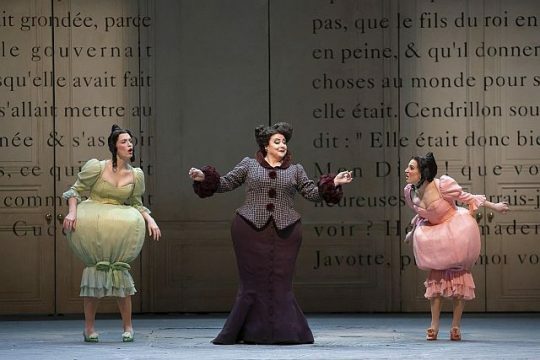 To quickly recap, Rigoletto, with a libretto by Francesco Mavia Piave, is based on Victor Hugo’s somewhat scandalous “Le roi s’amuse.” Verdi substituted a licentious duke for the king. The character Rigoletto is a bitter, hunchbacked jester who dislikes his position, makes fun of the Duke’s courtiers he is supposed to entertain and is disliked in return. His only love is for his daughter, Gilda whom he tries to keep from harm by not allowing her out except for church. Because she had fallen in love with the Duke when seeing him stare at her in church, she is happy he comes to the house where her father has been keeping her. Gilda is abducted by the couriers who mistakenly believe she is Rigoletto’s mistress and she is brought to the court where it is assumed the Duke ravishes her. Her distraught father plots revenge using Sparafucile (Alexander Tsymbalyuk), an assassin he met earlier. Gilda who is supposed to dress like a boy and meet up with her father in Verona, overhears the assassin’s plan to stab the Duke. Even though she felt betrayed by the Duke who fell for the assassin’s seductive sister, Maddalena (Zanda Svede), Gilda still loved him and deliberately stepped into Sparafucile’s house to be murdered instead. She had heard Sparafucile agree to kill the next person who walked in because he needed a body and Maddalena had pleaded for the Duke’s life. The tragedy is blamed on a curse by Count Monterone (Todd Thomas) who had cursed the Duke and Rigoletto after his own daughter had been seduced by the Duke, encouraged by Rigoletto. 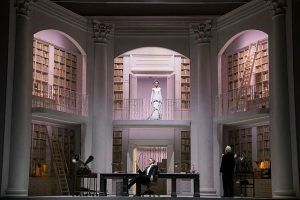 Directed by E. Loren Meeker, conducted by Mario Armiliato with stylisticly simple but dramatic back drops by Michael Yeargan, this new-to Lyric production should match opera aficionados’ expectations and attract new opera goers. DETAILS: “Rigoletto” is at the Lyric Opera House (also called the Civic Opera House), 20 N. Wacker Dr., Chicago, now through Nov. 3, 2017. Running time is 2 hours, 33 minutes including one intermission. For tickets and more information call (312) 827.-5600 and visit Lyric Opera Rigoletto. For Lyric season visit Lyric. An extraordinary pairing of the Joffrey Ballet with the exceptional voice of tenor Dimitry Korchak opened Lyric Opera’s 2017-2018 season Saturday, Sept. 23. The opera is the August 1774 Paris version of Chrisoph Willibald Gluck’s ‘Orphée et Eurydice’ with a libretto by Pierre-Louis Moline. However, the production is all John Neumeier. Longtime director and chief choreographer of the Hamburg Ballet, Neurmeier did the choreography, set, lighting and costume design and directed the production. In his contemporary production, Orphée is a choreographer rehearsing a ballet based on Arnold Bocklin’s painting, “The Isle of the Dead.” His wife, Eurydice, is his star but when she arrives late they argue and she storms off. After an impressive auto crash that pushes through the scenery, Eurydice is shown thrown from the car and dead on the ground. Orphée’s assistant is a jean-clad Amour, with a sprite-like Peter Pan quality. Armour tells him to go to Hades and bring back Eurydice. Mirrored moving panels create an interesting background in the rehearsal studio. That is, except when they reflect the lights from the opera house’s tiers. Dimitry Korchak (Orphee) and Andriana Chuchman) with some Joffrey Ballet members. Grey and white cutaway panels provide spaces that allow a small stage focus on Orphées bedroom and a moving path for him and Eurydice to wander from Elysium back to life on earth. Even with its modern take, audiences delighted to get both world-class ballet with the exquisite voices of Korchak as Orphée, Andriana Chuchman as Eurydice and Lauren Snouffer as Amour, will love the entire experience. Guests who normally come just for the opera, might find some of the ballet sequences and meanderings to be a bit lengthy. Gluck added ballet sequences to this version including the “Dance of the Furies” and the “Dance of the Blessed Spirits.” The final dance sequence of Orphée’s ballet is also very long. Even though the Joffrey dancers perfectly execute what was choreographed, viewers might wonder at some of the mechanical-toy style of some of the movements in the “Dance of the Furies” and at the mix of traditional and contemporary ballet. The story, frequently told in opera, theater and literature, goes back to Greek mythology when Orpheus, son of Apollo, falls in love and marries the beautiful Eurydice. But when she dies (by a snake bite in the story and a car accident in the Lyric opera) Orpheus is told by Apollo in the myth but by Amour (think Cupid or Eros) in the Lyric opera to go to Hades and try to bring her back. Andriana Chuchman, Dimitrhy Korchak and Joffrey Ballet in Lyric opener. The myth has Orpheus making his way past the Furies and the three-headed Cerberus (three dancers) through his beautiful playing of lyre. He does so in this opera version with his sorrowful singing. The obstacle is he can only take Eurydice back with him if he doesn’t look at her or explain that as she follows him out. Eurydice doesn’t understand so cries and bitterly complains until he finally can’t resist so looks back and she dies. Orpheus leaves alone. In one version Amour feels sorry for him and returns Eurydice to life. In the Neumeier production, she is returned as a ghostly spirit in his heart and in the ballet he created. During the ballet Victoria Jaiani and partner Temur Suluashvili, are “doubles” of Eurydice and Orphée. Through it all are the wonderful voices of the Lyric Opera Chorus who are in the pit with maestro Harry Bicket and the fine orchestra. DETAILS: “Orphee et Eurydice” by Chrisoph Willibald Gluck’s, is at the Lyhric Opera House, 20 N. Wacker Dr., through Oct. 15, 2017. Running time: 2 hours, 20 minutes with one intermission. For tickets and other information visit Lyric Opera. The Lyric Opera of Chicago starts its next season Sept. 23, 2017 but you can get a sneak peek on Sept. 8 at 7:30 p.m. with Stars of Lyric Opera at Millennium Park. 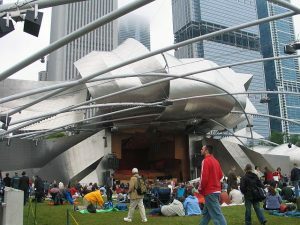 A free concert in the Jay Pritzker Pavilion, 201 E. Randolph St., Chicago, the preview includes arias from ‘Orphée et Euridice,’ ‘Rigoletto,’ ‘Die Walküre,’ ‘The Pearl Fishers’ and ‘Faust,’ among others. 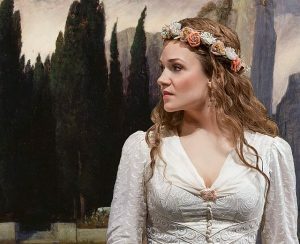 Led by Maestro Andrew Davis conducting the Lyric Opera Orchestra and Chorus, the program features such stars as Andriana Churchman, Dmitry Korchak, Eric Owens and Matthew Polenzani. For more information visit Lyric Opera and the Lyric Stars on Facebook. The operas listed for the preview offer just a glimpse of the Lyric’s exciting 2017-18 season. The complete opera schedule exhibits a wide range of styles, moods and composers from Bizet and Mozart to Verdi and Wagner. By Christoph Willibald Gluck, the opera features The Joffrey Ballet, Sept. 23-Oct. 15, 2017. This is the Paris version directed and choreographed by John Neumeier. It is about the mythological Greek musician/poet, Orpheus, trying to bring back his wife, Eurydice, from the Underworld. 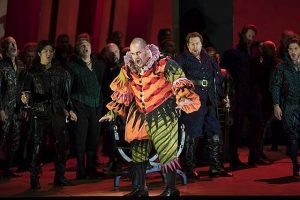 By Giuseppe Verdi, Oct. 7-Nov. 3, 2017, the opera centers on the revenge-bound, tragic court jester, Rigoletto, daughter Gilda and the evil Duke of Mantua. 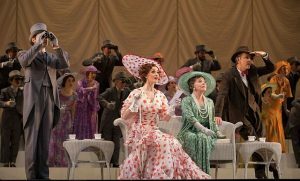 Opera goers will recognize Mantua’s “La donna è mobile,” Gilda’s “Caro nome” and the opera’s famed quartet. By Richard Wagner, Nov.1-30, 2017, the opera continues the Lyric’s Ring cycle which started in 2016 with ‘Das Rheingold.’ Wagner’s powerful music exemplifies the strong emotions and character traits of Siegmund, Sieglinde, Brünnhilde, Wotan, Fricka and Hunding. By Georges Bizet, Nov. 19-Dec. 10, the opera includes this writer’s favorite duet for tenor and baritone. The opera takes place in Ceylon where two friends fall in love with priestess Leila. By Vincenzo Bellini, Feb. 4-28, 2018, is a bel canto opera calling for exceptional technique as it tells the story of lovers in a England divided by the 1600’s civil war. 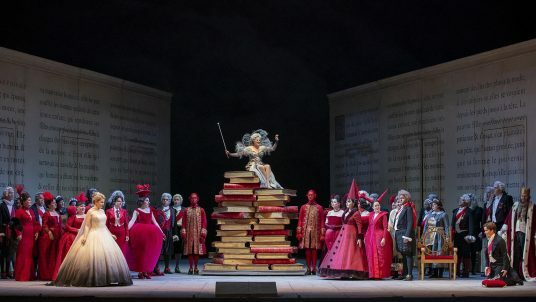 By Wolfgang Amadeus Mozart, Feb. 17-March 16, 2018 the opera is a delightful light treat that works well on the heels of ‘I Puritani’s’ high drama. Mozart’s tale delves into intrigue worthy of Shakespeare’s comedies. By Charles Gounod, Mar. 3-21, 2018, the opera revolves around the consequences of selling one’s soul to the devil. A popular story told in the Grand Opera style, it includes Marguerite’s “Jewel Song” and an exceptional final trio. The Lyric Opera is at the Civic Opera House, 20 N. Wacker Dr., Chicago. For additional programs and ticket information visit Lyric or call (312)827-5600. The wonderfully lyrical songs and the delightfully fun numbers in Alan Jay Lerner and Frederick Loewe’s ‘My Fair Lady’ plus the gorgeous voice of Lisa O’Hare as Eliza Doolittle and Anthony Powell’s costumes are reasons enough to see the Lyric’s show. Bryce Pinkham who played Monty Navarro on Broadway in “A Gentleman’s Guide to Love and Murder,” was a treat to hear as he sang “On the Street Where You Live” as Freddy Eynsford Hill. 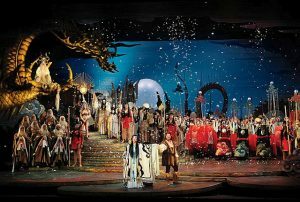 So was the ensemble, many of whom either hailed from the Lyric Opera Chorus or past Lyric operas. Powell’s period costumes made exceptional fashion statements that defined the characters. 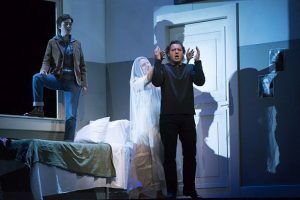 The voices, music, lyrics and the story based on George Bernard Shaw’s “Pygmalion” make up for some of the production’s deficiencies. Richard E. Grant as Henry Higgins appears unaccountably childish, particularly when he waves his arms about in his mother’s home and when back at his office. In addition, the acts don’t flow well. There is a what-are-we-supposed–to-do-now moment when Eliza visits her father after she has become a lady, and the excellent dancers in Alfred Doolittle’s drunken pre-marriage morning scene move in a way more appropriate for a Parisian Apache street then one in London. Set Designer Tim Hatley’s Ascot scene, shown first in silhouette, perfectly emulated the stiff, no emotion can be shown, restraint expected of the British upper class and O’Hare was grandly shocking in her close encounter with the race and Mrs. Higgins friends. However, that same stiffness seemed to pervade the production except for Hill’s song and when Eliza encounters him outside Henry Higgens home. 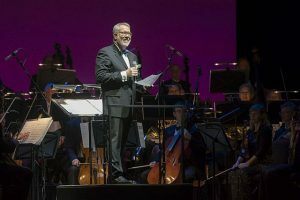 The music, conducted by Broadway veteran David Chase, reminded audiences why “My Fair Lady” continues to be a draw more than 60 years after it debuted. Directed by Olivier Fredj, the Lyric’s show is the Robert Carsen production for Paris’ Théâtre du Châtelet starring a new cast. Details: ‘My Fair Lady’ is at the Lyric’s Civic Opera House, 20 N. Wacker Drive, Chicago, April 28 through May 21, 2017. For tickets and other information call (312) 827-5600 or visit My Fair Lady.